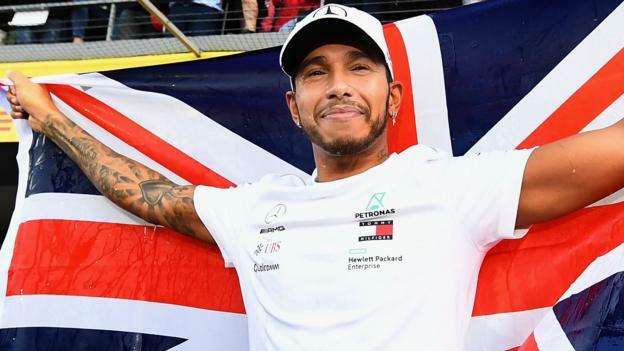 Lewis Hamilton has been breathing rarefied air for a while now, but as he sealed his greatest achievement so far, a fifth Formula 1 world championship, the overwhelming thought was just how much further he could go. VOTE: Who is the best F1 driver ever? The 33-year-old is the equal second most successful driver in history, in terms of titles, drawing level with the great Argentine Juan Manuel Fangio. Suddenly, Michael Schumacher’s all-time record of seven, which for a while looked impregnable, is within reach. Hamilton’s Mercedes team have triumphed in every single year since the introduction of F1’s turbo hybrid engines in 2014. But a large part of the reason they have done so this season is because their lead driver has reached new heights. As long as the team remain competitive, the way he has been driving it is hard to see anyone stopping him. Hamilton’s achievement this year will surely go down as his greatest so far. He has maintained a level of excellence not only way out of reach of his only real rival, Ferrari’s Sebastian Vettel, but at a consistency Hamilton himself has not achieved before. The scale of the accomplishment becomes clearer when one considers that he has brought the season to a premature close with two races to go despite not having the fastest car the majority of the time. The measure of a truly great driver is that he can take his equipment to places it has no right to go to, and which others cannot reach. In that, Hamilton has truly proven his mettle this year. On top of that, it has been a virtually flawless season. It is hard to think of a single serious mistake. And while he has had a couple of off-races, they have not been as noticeable as in the past. He even won on one of those weekends. Not for nothing, then, did Mercedes technical director James Allison describe Hamilton’s driving this year as “peerless”. Right now, in F1, that is exactly what he is. The raw statistics of the 2018 season tell only part of the story. Hamilton has won nine races and taken nine pole positions; Vettel five of each. The basic maths of that equation explain why Hamilton is already champion, with the Brazilian and Abu Dhabi Grands Prix still to come. But what the statistics do not say is that Mercedes have probably had the fastest car at only eight of the 19 races so far, and yet Hamilton has won nearly double the number of races of his closest challenger. The margins between the two cars have generally been very small. But at four of the races where Ferrari had an edge, Hamilton has emerged the winner, through a combination of his own brilliance behind the wheel and the errors Ferrari and Vettel have made in trying to combat it. Occasionally, luck has been on his side – he would not have won in Azerbaijan had Vettel not made a mistake and run wide trying to take the lead from Hamilton’s team-mate Valtteri Bottas at a re-start after a safety-car period, and then Bottas suffered a puncture after running over debris. And had it not rained in qualifying in Hungary, the Ferraris would almost certainly have locked out the front row, and Vettel gone on to victory. But Hamilton then made his own luck, with his usual brilliance in wet conditions, and in the race Ferrari might have pushed him harder had they not made a strategic mistake that put Vettel back behind Bottas when he had already passed the Finn. Yet the three races that best defined the season were Germany, Italy and Singapore. In Germany, the race before Hungary, he brought himself back into contention for the lead from 15th on the grid after a hydraulics failure in qualifying. Then, in a late-race shower of rain, Hamilton closed seven seconds on Vettel in four laps, Vettel matched him on the next lap – and then crashed out of the lead. Hamilton went on to win. After Hamilton’s wins against the head in Germany and Hungary, Vettel dominated the Belgian Grand Prix and should also have won Ferrari’s home race in Italy a week later. Instead, he and Ferrari made a collective failure that will likely haunt them for some time. First, the team sent the drivers out in the wrong order in qualifying, with Vettel ahead of team-mate Kimi Raikkonen, so Ferrari’s number one driver ended up giving their number two the benefit of a slipstream – and pole position. Then, with Raikkonen ahead of Vettel on the front row, the two drivers were allowed to race on the first lap, rather than protect their positions against Hamilton, starting just behind. Raikkonen defended his lead from his team-mate, Vettel left the door open on the outside of the second chicane, and Hamilton passed him. To add insult to injury, Vettel slid into Hamilton and spun to the back. Hamilton went on to take a brilliant victory, chasing down Raikkonen, paying Vettel and Ferrari back for their win at his home race in Silverstone. But perhaps Hamilton’s crowning achievement was Singapore. At a track where Mercedes have traditionally struggled, the team finally got their car to work, and Hamilton responded with what he believes was probably the greatest lap of his life to take pole. Mercedes were stunned. Hamilton’s engineer Peter Bonnington talked about the “silence” on the radio after the time came in, nearly 0.7secs clear of anyone else at the time. “It was a lot of jaws hitting the floor,” he said. Allison, chatting about the season at the US Grand Prix a week ago, called it “the single greatest lap in the history of the world”. He was half-joking, the hyperbole accompanied by a wry smile, but the over-statement for effect gave a sense of just how good the lap was. And that is how Hamilton has been for much of the year – a class apart from everyone else. The fact that Vettel has under-performed should not diminish the scale of Hamilton’s achievement. Yes, the German’s season has been typified by a series of errors – as well as Germany and Italy, crashing into Bottas at the start in France, further spins while in battle in Japan and America. But the sense is that Vettel has been feeling the pressure not only of leading a team that at times has not looked ready to take on Mercedes, even when Ferrari had a faster car, but also of fighting a battle against a personal opponent whose strength he could not match. On top of that, the fact that Ferrari lost their way technically for three races after Monza put the final nail in the coffin. As for Hamilton, it has been a season of all-round excellence. He had already done enough to justify being considered as perhaps the fastest driver F1 has ever seen. His racing skills have been superlative. And he has worked with his team better than ever before. Vettel, to his credit, admitted he had been beaten by a better man. He described Hamilton’s championship as “well deserved”. And in a very classy touch, he then went into the Mercedes building to congratulate all the engineers. What can Hamilton now go on to achieve? His 71 wins leave him still 20 behind Schumacher, but he is averaging just under 10 a year at the moment, so if Mercedes keep up their performance, both the German’s records are achievable. For all his jet-set lifestyle, Hollywood friends and, this year, branching out to design his own fashion collection, Hamilton remains as driven as ever to succeed in the arena in which he has achieved his fame and fortune. Wolff said: “As long as he is in a good car and continues to enjoy it in the way he does today, there is more to come. After the race, Hamilton was quick to pay tribute to the two men with whom he now shares his exalted statistical status. “Michael’s still quite far ahead in race wins so you have to say he’s still the ‘GOAT’ (greatest of all time),” said Hamilton. At the time of his greatest success, Hamilton, as he often does, referred back to his earliest days, his humble beginnings on a council estate in Stevenage still forefront in his mind, still providing motivation despite the wealth and fame that have come his way since. “If you could see how tough it was for us in the beginning – even this year, still fighting those obstacles and still coming stronger and stronger each year – I feel like I’m still driving with that fierce fire I had when I was eight years old,” he said. “So I’ll keep going until that goes. Which I don’t think is ever going to go, but my body will probably run out at some stage. “I’ve still got things to achieve, still so many targets, so many things ahead. “The way I have always approached it is to be really thankful for the ones you have. Whether I have the chance to win more, who knows? But I am going to give it everything to do so.